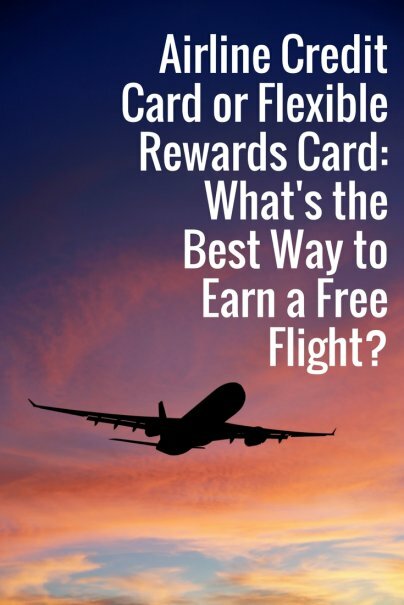 Home » Frugal Living » Travel » Airline Credit Card or Flexible Rewards Card: What's the Best Way to Earn a Free Flight? When it comes to strategizing how to earn free airfare with travel rewards credit cards, there are two main schools of thought. On one hand, you can sign up for your favorite airline's frequent flyer program and get their co-branded credit card to earn miles through regular spending and flying. Or, you can get a credit card that lets you earn flexible travel rewards good for any airline instead. Both strategies can be advantageous depending on your travel style and goals. Still, earning a free flight becomes easier when you're able to make an informed decision about what type of travel rewards card is right for you. So, which should you choose? Airline miles or travel credit? While each airline loyalty program works differently, they all follow a similar format. When you pay for a flight, you earn frequent flyer miles based on the cost of your paid airfare and/or the many miles you fly. You can get more points by using the airline's credit card to pay for it. Keep in mind that, on top of your miles, you'll need to pay government-mandated taxes and fees. These fees are usually $5.60 per leg for domestic flights, but can range in the hundreds of dollars for flights abroad. The fees also differ with airlines. Do your research before you settle on the airline program to pursue miles with. Other factors include where they fly and their partner airlines that you'd be able to get use miles for. Also, blackout dates and award seat availability are factors, too. These are the things you should look for when considering a frequent flyer program to join. Being able to earn miles through other ways than flying with that airline makes racking up miles easier and faster, which means free flights faster. Airline credit cards will often give points for all spending, and maybe even bonus points for additional categories. If you don't want to be tied down to a particular airline or deal with restrictions and limitations on using your miles, there are travel rewards credit cards that allow you to accrue points through spending, which you redeem via a statement credit toward your travel purchases. For example, if you have 40,000 points, you can book a flight through any airline or booking service on your credit card, and then apply the 40,000 points (which comes out to $400) to pay for it. It will appear as a statement credit on your account. There are many benefits to this. What are those benefits? Let's have a look. Book any type of travel reservation you want. You don't need to go through the program's portal website. You aren't limited by airline or award availability. You can choose to book through a travel site like Orbitz or Airbnb. If you have specific travel plans you'd like to stick with, as well as companions, this type of travel program will be the best way for you to use your rewards for travel. While there are some programs that allow you to pay for additional miles if you don't have quite enough, or pay the difference in cash, most frequent flyer programs do not allow this. This means that if you only have enough for one flight, but you have two travelers, you'd have to pay for one ticket with miles, and then do a separate transaction for the second ticket. That's only when you're able to split up a purchase like that. Maybe you are just shy of 100 miles for that flight to Europe. Or that all inclusive vacation package. Some programs simply won't allow you to book. But with a flexible travel program, you can make a $450 travel reservation, use 40,000 points for a $400 credit, and then pay for the $50 balance. For those who don't often travel, it's hard to build up a balance of miles through a frequent flyer program. Credit cards that offer statement credits on travel purchases allow you to earn points through regular spending, even offering bonus points for everyday categories like dining and groceries. This is the best way for non-frequent flyers to be on their way to travel redemption faster. There is an option that stands between the two. These are travel rewards cards that have their own rewards program. For example, Chase cardholders earn Ultimate Rewards Points. American Express users earn Membership Rewards Points. Each program has its own set of travel partners and includes a travel portal that allows you to book flights, hotel stays, car rentals, and vacation packages with points. Additionally, you may be able to transfer your points to airline or hotel loyalty programs, many times at a 1:1 ratio so you don't lose a single point of value. The best way to decide which program and credit card is right for you is to determine your travel goals and preferences. Are you dedicated to one particular airline? Are you traveling in a large group? Do you have flexibility in your travel dates and destinations? Do you enjoy special travel perks and benefits? These questions will help you choose the best travel rewards card for you.